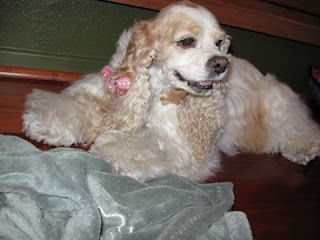 Buffy entered my life March 30 2001, she came into my life though not planned. 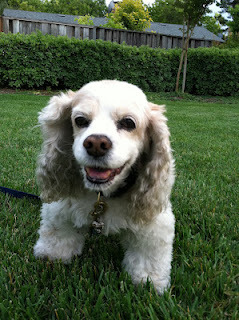 At the time, Gizmo was with me and had been diagnosed with a brain tumor. During one night researching about brain tumors, I stumbled across my Betty Boop. Months after that night finding Betty Boop, the date arrived that I would meet Betty Boop. I drove 2hrs to go and meet Betty Boop and fell in love instantly. As I was leaving, there sat this beautiful Cocker Spaniel; she was shaking and looked all confused. I asked about her and then they told me the horrific story. Two men severely abused her; to the point where they left the hair on her legs grow together so she couldn’t run. My heart ached and I had to have her, she was coming home with me. I told the person that I wanted to take her home too; however, I was informed that another lady was to have her. 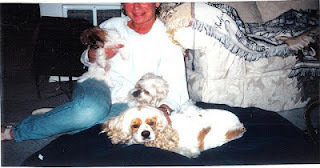 While I was crushed, I knew that I had to care for Gizmo and now Betty Boop (at the time, no idea what her care would fully entail). As I was speaking to this person, I mentioned that I worked from home. The next thing I knew Buffy was coming home with me. See, the woman that was to take her, was on the road a lot and Buffy needed someone 24/7 to rehabilitate and trust the world again. And so, our journey; or should I say, love story began. Over the course of those months, Buffy was learning to trust. Gizmo passed only after a few weeks that Buffy came home. 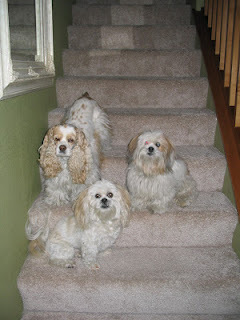 The day that Gizmo passed, she walked up to Buffy, barked and barked and barked, Buffy acknowledged her with a soft nudge. 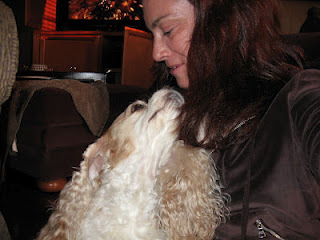 I often wonder what was said; however, I would like to think that Gizmo passed the torch in taking care of me. Over the years, Buffy did just that, in her special way. Our bond over the years grew stronger than one could ever imagine. She knew when I was coming home before I would even arrive; I would often be told that moments before I would arrive, she would get up and run to the door and begin sniffing and wagging her adorable little tail. I had given her tail the nickname, “wiggle worm”; when I would tell her to “shake your little wiggle worm”, her tail would go 1000 mph. When Mr MaGoo came along, Buffy went into Mother role and guided Mr MaGoo, showing him the ropes. Of course, Mr MaGoo had his own agenda and there were many times that Buffy stepped right up to the plate and put him in his place. I would tell people that she pinned him down, of course, most found it hard to believe because she was so gentle. I am here to tell you, Buffy was patient, tolerant, yet a leader and knew when to step in. Then, I was handed medical challenges over the years. In 2004, diagnosed with Cushing’s. When I discovered it was an autoimmune disease, I went into full force to keep her protected. March 10 2010, then, she was diagnosed with TCC (bladder cancer). I elected to have the cells removed; only, they came back 6 mos later. I was given choices: chemo, radiation, surgery..all of which I declined. I elected to leave as is; with her Cushing’s and age (13), I did not want to put her at any more risk. Early 2012, she developed pancreatitis; only to be diagnosed with severe CHF (mitral valve) immediately following. The CHF came on very sudden and was relentless. I knew in my heart that I would need to let go soon; however, not without a fight. For 30 days after been diagnosed with CHF, I did everything to keep her comfortable and beat this. She needed help with eating, no problem; I hand fed her. She needed help getting somewhere, I carried her. She needed help drinking, I held her ears. It was her and I, everything and everyone could and would wait. I dedicated my time for her; I was not going to let her down. She had great days too, and she would let me know; she would take off up the stairs. Or, stand at the door with her “little wiggle worm” moving at 1000 mph, because she wanted to go for a walk. As hard as I was trying, her heart was giving out and shutting down. I was fighting the cancer for her for all these years, and, it was her little heart that gave out. As anyone knows, Cushing’s is not what is one’s pets demise, it are the organs that Cushing’s goes after. Her and I fought the liver and won; her and I fought the lungs and we won. And then, her heart; and together we fought like we never fought before. Even hours before I had to let go, she wanted to go on a walk; March 7th was picture perfect and who was I to deny what would make her happy. I had a strange feeling inside that this would be our last walk together, and, I am so glad that I caught it on video. I can’t explain how I knew; perhaps it was the night before when she snuggled up against me so so tight and fell asleep with her head in my neck. I cried myself to asleep with her snuggled up against me, because, I knew she was telling me and showing me “thank you Mom, I know that you did all you could, but, I now need to go and I love you Mom”. When we arrived at the vet’s office I again had that sinking feeling; she wasn’t herself at the vet’s. Normally, she would be alert and shaking like “Chicken Little”; not this time. As soon as I sat down, I held her in my arms and she fell into a deep sleep. It was as if, she relaxed knowing that I would send her to be a puppy again. As I realized this, I sat there fighting tears back, I knew I had to let her go and play again. As Mr MaGoo would tell anyone, her heart was so big and enlarged, because she had so much love. 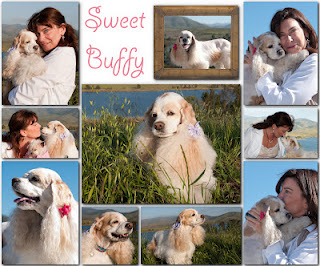 Anyone who had the honor and blessing to meet Buffy would tell you, she was full of love. Throughout the years, she would watch over Betty Boop; she was the Mother that she never got to me. 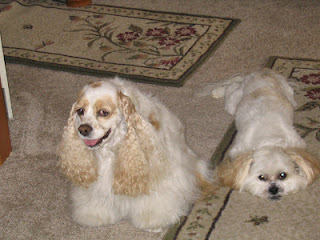 When Betty Boop passed, I had the wonderful opportunity to watch Mimi; Buffy and she became BFF instantly. Buffy immediately went into “Mother role” and would help Mimi. 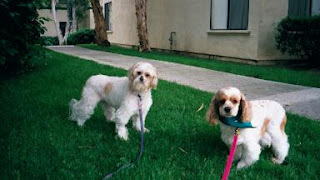 Mimi sadly went to Rainbow Bridge; only weeks before Buffy, and now they are BFF’s again. Buffy, I don’t even know how to begin to thank you for these past years. You taught me the meaning of trust; your trust in me and mine in yours was unable to be measured. People would state that our relationship was extraordinary, and, as I look at the images, it clearly comes out. My Beautiful Buffy, I was truly blessed to have you in my life. As much as I did to keep you comfortable, now, you are in peace. You will no longer be tired, you are now a puppy again; running in lush grass and chasing birds like you did before. Mister Spunky is back! This time with a new friend, Farley. "The illustrations are very well drawn and clearly depict each scene. The pictures of Mister Spunky and Farley are adorable. I liked that there are colouring pages at the end of the book. I would definitely recommend this to all young readers." Together, Mister Spunky and Farley learn about the precious nature of life. “What can I say--this is a sweet, wonderful book about dogs (and co-written by one!). I have no choice but to give this a rating of a five! It deserves it and more! “ Buy Now! Proudly powered by WordPress | kreatif WordPress Theme by InkHive.